For the past 30 years, my actual paid job (as opposed to my blogging hobby) has been Managing Editor of the Journal of Economic Perspectives. The journal is published by the American Economic Association, which back in 2011 decided--much to my delight--that the journal would be freely available on-line, from the current issue back to the first issue in 1987. Here, I'll start with Table of Contents for the just-released Summer 2016 issue. Below are abstracts and direct links for all of the papers. I will almost certainly blog about some of the individual papers in the next week or two, as well. Students in some countries do far better on international achievement tests than students in other countries. Is this all due to differences in what students bring with them to school--socioeconomic background, cultural factors, and the like? Or do school systems make a difference? This essay argues that differences in features of countries' school systems, and in particular their institutional structures, account for a substantial part of the cross-country variation in student achievement. It first documents the size and cross-test consistency of international differences in student achievement. Next, it uses the framework of an education production function to provide descriptive analysis of the extent to which different factors of the school system, as well as factors beyond the school system, account for cross-country achievement differences. Finally, it covers research that goes beyond descriptive associations by addressing leading concerns of bias in cross-country analysis. The available evidence suggests that differences in expenditures and class size play a limited role in explaining cross-country achievement differences, but that differences in teacher quality and instruction time do matter. This suggests that what matters is not so much the amount of inputs that school systems are endowed with, but rather how they use them. Correspondingly, international differences in institutional structures of school systems such as external exams, school autonomy, private competition, and tracking have been found to be important sources of international differences in student achievement. A new push for accountability has become an increasingly important feature of education policy in the United States and throughout the world. Broadly speaking, accountability seeks to hold educational institutions responsible for student outcome using tools ranging from performance "report cards" to explicit rewards and sanctions. 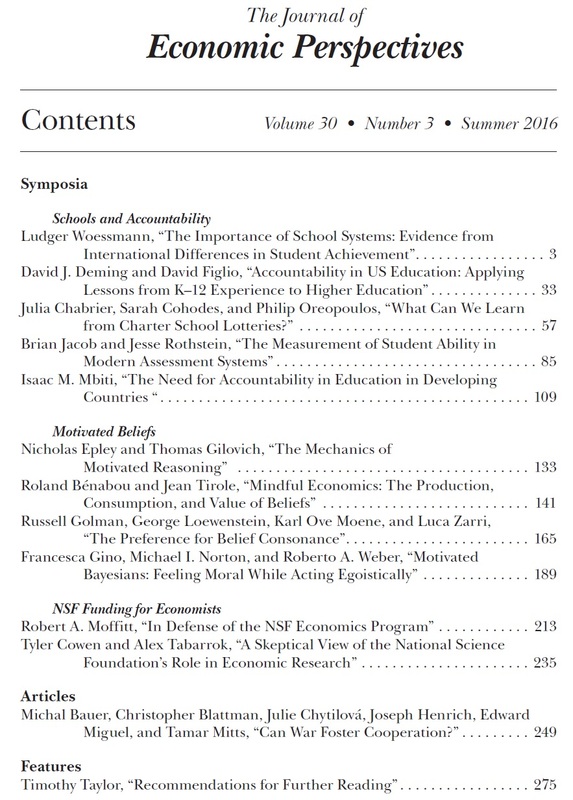 We survey the well-developed empirical literature on accountability in K-12 education and consider what lessons we can learn for the design and impact of college ratings. Our bottom line is that accountability works, but rarely as well as one would hope, and often not entirely in the ways that were intended. Research on K-12 accountability offers some hope but also a number of cautionary tales. We take a closer look at what can be learned about charter schools by pooling data from lottery-based impact estimates of the effect of charter school attendance at 113 schools. On average, each year enrolled at one of these schools increases math scores by 0.08 standard deviations and English/language arts scores by 0.04 standard deviations relative to attending a counterfactual public school. There is wide variation in impact estimates. To glean what drives this variation, we link these effects to school practices, inputs, and characteristics of fallback schools. In line with the earlier literature, we find that schools that adopt an intensive "No Excuses" attitude towards students are correlated with large positive effects on academic performance, with traditional inputs like class size playing no role in explaining charter school effects. However, we highlight that No Excuses schools are also located among the most disadvantaged neighborhoods in the country. After account ing for performance levels at fallback schools, the relationship between the remaining variation in school performance and the entire No Excuses package of practices weakens. 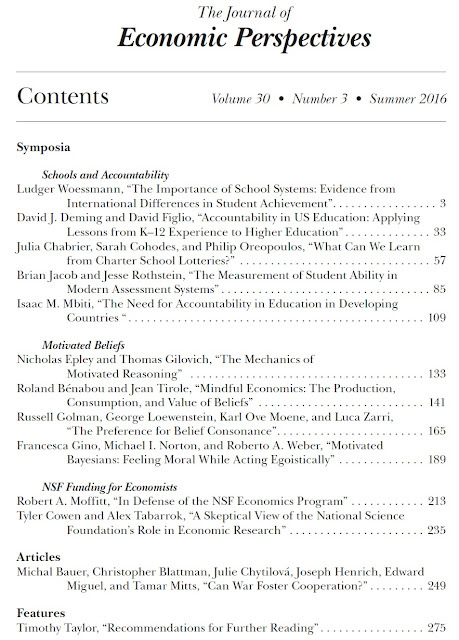 No Excuses schools are effective at raising performance in neighborhoods with very poor performing schools, but the available data have less to say on whether the No Excuses approach could help in nonurban settings or whether other practices would similarly raise achievement in areas with low-performing schools. We find that intensive tutoring is the only No Excuses characteristic that remains significant (even for nonurban schools) once the performance levels of fallback schools are taken into account. Economists often use test scores to measure a student’s performance or an adult’s human capital. These scores reflect non-trivial decisions about how to measure and scale student achievement, with important implications for secondary analyses. For example, the scores computed in several major testing regimes, including the National Assessment of Educational Progress (NAEP), depend not only on the examinees’ responses to test items, but also on their background characteristics, including race and gender. As a consequence, if a black and white student respond identically to questions on the NAEP assessment, the reported ability for the black student will be lower than for the white student—reflecting the lower average performance of black students. This can bias many secondary analyses. Other assessments use different measurement models. This paper aims to familiarize applied economists with the construction and properties of common cognitive score measures and the implications for research using these measures. Despite the rapid growth in enrollment rates across the developing world, there are major concerns about the quality of education that children receive. Across numerous developing countries, recent learning assessments have revealed that children are not able to develop basic numeracy and literary skills. These low levels of learning are the result of a number of interrelated factors, many of which reflect the low levels of accountability across multiple levels of the education system. In this paper, I document the main education challenges facing developing countries, including the lack of accountability among teachers and school management. I also review recent literature that documents the effectiveness of interventions aimed at addressing these accountability issues. Finally, I assess the potential for the market to improve accountability in the education sector in developing countries. Whenever we see voters explain away their preferred candidate's weaknesses, dieters assert that a couple scoops of ice cream won't really hurt their weight loss goals, or parents maintain that their children are unusually gifted, we are reminded that people's preferences can affect their beliefs. This idea is captured in the common saying, "People believe what they want to believe." But people don't simply believe what they want to believe. Psychological research makes it clear that "motivated beliefs" are guided by motivated reasoning--reasoning in the service of some self-interest, to be sure, but reasoning nonetheless. People generally reason their way to conclusions they favor, with their preferences influencing the way evidence is gathered, arguments are processed, and memories of past experience are recalled. Each of these processes can be affected in subtle ways by people's motivations, leading to biased beliefs that feel objective. In this symposium introduction, we s et the stage for discussion of motivated beliefs in the papers that follow by providing more detail about the underlying psychological processes that guide motivated reasoning. In this paper, we provide a perspective into the main ideas and findings emerging from the growing literature on motivated beliefs and reasoning. This perspective emphasizes that beliefs often fulfill important psychological and functional needs of the individual. Economically relevant examples include confidence in ones' abilities, moral self-esteem, hope and anxiety reduction, social identity, political ideology, and religious faith. People thus hold certain beliefs in part because they attach value to them, as a result of some (usually implicit) tradeoff between accuracy and desirability. In a sense, we propose to treat beliefs as regular economic goods and assets--which people consume, invest in, reap returns from, and produce, using the informational inputs they receive or have access to. Such beliefs will be resistant to many forms of evidence, with individuals displaying non-Bayesian behaviors such as not wanting to know, wishful thinking, and reality denial. We consider the determinants and consequences of a source of utility that has received limited attention from economists: people's desire for the beliefs of other people to align with their own. We relate this 'preference for belief consonance' to a variety of other constructs that have been explored by economists, including identity, ideology, homophily, and fellow-feeling. We review different possible explanations for why people care about others' beliefs and propose that the preference for belief consonance leads to a range of disparate phenomena, including motivated belief-formation, proselytizing, selective exposure to media, avoidance of conversational minefields, pluralistic ignorance, belief-driven clustering, intergroup belief polarization, and conflict. We also discuss an explanation for why disputes are often so intense between groups whose beliefs are, by external observers' standards, highly similar to one-another. Research yields ample evidence that individual's behavior often reflects an apparent concern for moral considerations. 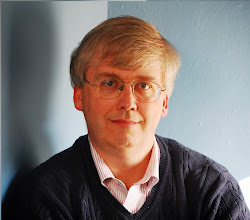 A natural way to interpret evidence of such motives using an economic framework is to add an argument to the utility function such that agents obtain utility both from outcomes that yield only personal benefits and from acting kindly, honestly, or according to some other notion of "right." Indeed, such interpretations can account for much of the existing empirical evidence. However, a growing body of research at the intersection of psychology and economics produces findings inconsistent with such straightforward, preference-based interpretations for moral behavior. In particular, while people are often willing to take a moral act that imposes personal material costs when confronted with a clear-cut choice between "right" and "wrong," such decisions often seem to be dramatically influenced by the specific contexts in which they occur. In particular, when the c ontext provides sufficient flexibility to allow plausible justification that one can both act egoistically while remaining moral, people seize on such opportunities to prioritize self-interest at the expense of morality. In other words, people who appear to exhibit a preference for being moral may in fact be placing a value on feeling moral, often accomplishing this goal by manipulating the manner in which they process information to justify taking egoistic actions while maintaining this feeling of morality. The NSF Economics program funds basic research in economics across all its disparate fields. Its budget has experienced a long period of stagnation and decline, with its real value in 2013 below that in 1980 and having declined by 50 percent as a percent of the total NSF budget. The number of grants made by the program has also declined over time, and its current budget is very small compared to that of many other funders of economic research. Over the years, NSF-supported research has supported many of the major intellectual developments in the discipline that have made important contributions to the study of public policy. The public goods argument for government support of basic economic research is strong. Neither private firms, foundations, nor private donors are likely to engage in the comprehensive support of all forms of economic research if NSF were not to exist. Select universities with large endowments are more likely to have the ability to support general economic research in the absence of NSF, but most universities do not have endowments sufficiently large to do so. Support for large-scale general purpose dataset collection is particularly unlikely to receive support from any nongovernment agency. On a priori grounds, it is likely that most NSF-funded research represents a net increase in research effort rather than displacing already-occurring effort by academic economists. Unfortunately, the empirical literature on the net aggregate impact of NSF economics funding is virtually nonexistent. We can imagine a plausible case for government support of science based on traditional economic reasons of externalities and public goods. Yet when it comes to government support of grants from the National Science Foundation (NSF) for economic research, our sense is that many economists avoid critical questions, skimp on analysis, and move straight to advocacy. In this essay, we take a more skeptical attitude toward the efforts of the NSF to subsidize economic research. We offer two main sets of arguments. First, a key question is not whether NSF funding is justified relative to laissez-faire, but rather, what is the marginal value of NSF funding given already existing government and nongovernment support for economic research? Second, we consider whether NSF funding might more productively be shifted in various directions that remain within the legal and traditional purview of the NSF. Such alternative focuses might include data availability, prizes rather than grants, broa der dissemination of economic insights, and more. Given these critiques, we suggest some possible ways in which the pattern of NSF funding, and the arguments for such funding, might be improved.